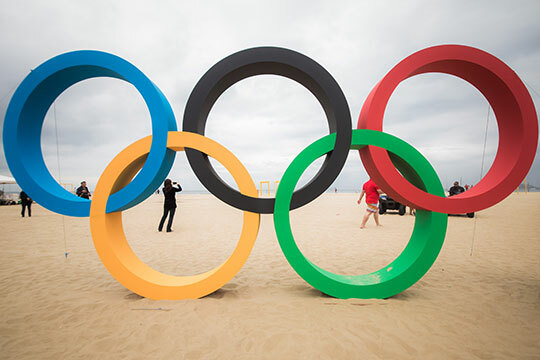 Copacabana Beach, one of Rio’s great gems, will now be adorned with the Olympic rings. A sculpture of the rings made of recycled plastic was set up in the sand this Thursday, July 21. The piece was designed by artist Elisa Brasil and commissioned by the City Hall. The five rings are three meters tall and more than six meters wide and will form yet another attraction for the Rio 2016 Olympic Games. Elisa Brasil’s recycling technique involves shredding, heating and pressing the plastic to form a new plate that makes up the base of each ring. PET bottles were reused to make up the sculpture’s base and add sturdiness to all five rings, which were built together. Overall, 65kg of recycled material was used in the sculpture, the plastic of which was collected across the city. Twenty people took part in the production process.